SHE's off travelling again, after finding a cheap(ish) flight. The date was familiar. It was important. It is my (Bella's) birthday. I'm going to be seven years old. SHE'll be halfway to the U.S.
those days that start out WRONG. NO walk and a couple of extra water bowls. Well......we had one on Sunday. 5 HOURS after our dinner time. SHE went to Sydney for lunch with friends. And we got NO doggy bag. Dui barked at Mary, so Mary barked at Dui. 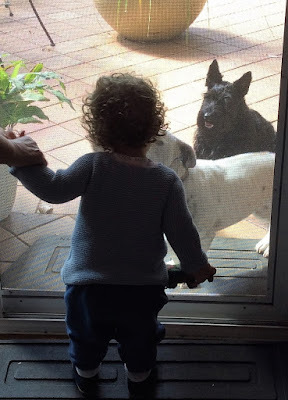 They played that game for awhile, until Mary got closer to the screen door. Then Mary kissed Roxy through the screen. 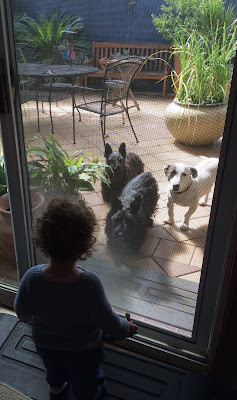 We got to sniff her properly when she came outside. Mary is the first little biped we've ever seen close up. We always stop off at our favourite stall on the way to the river....well, SHE does, we have to stay in the car. Today we got some beef tendons, kangaroo tail, and billy's willies. You've heard of Bully Sticks, well these come from goats. SHE says not as many calories in them. These pups' peeps own the stall. We had the roo tails when we got home.....yum!